Before we can start playing with ReasonML we need to install a toolchain to build our project. First of all, we need to install OPAM, which is something like npm in the NodeJS world. With OPAM, we can install and update our packages. OPAM can be installed globally with a "brew install gpatch" or a "brew install opam," or you can follow a more detailed installation guide here. Let’s check our installation with “opam --version”. You should see something like "2.0.1"
Dune will manage your project with Dune files. A Dune file is something like package.json. The main difference is that instead of JSON syntax we are using Lips-like syntax. we are describing packages that we will be using for our application. Next, we need to create a main.re file where we can put our ReasonML code, something like index.js in the NodeJS world. As for which GraphQL library will be best here, we will be using ocaml-graphql-server, which is a powerful option for a GraphQL server in the OCaml world. We will try to run a GraphQL example from OCaml GitHub. For simplicity, I’ve made a simple version of a GraphQL server. If you want, you can go with this, or you can try the complex one in the ocam-graphql repository with ‘subscriptions’ and more. (If you are unsure about Reason’s syntax, you can check it out here or watch a great video course here. With this type, we need to define our GraphQL schema. The syntax should be pretty straightforward. We can create a new Schema from the Graphql_lwt module and define what fields our GraphQL schema has and how it should resolve these fields. With our user schema, we are ready to create a main schema for our GraphQL server, which will have one query — users — and will return an array of our users. With all this ready, we can start our first GraphQL server written in native ReasonML! You can review the whole project example here. That’s it! You have successfully build your first GraphQL server with ReasonML and OCaml! You can now start exploring all others OCaml libraries and try using them with ReasonML in your projects. Next time, we will focus on other cool stuff from the OCaml universe like MirageOS and connect our server to the real database. 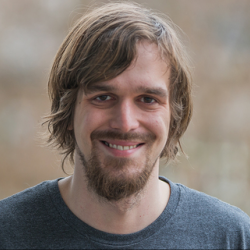 Pavel is a passionate developer who’s in love with all kinds of technologies. Seriously. He is married to NodeJS and occasionally takes GraphQL as a lover.